Article of Best tourist attraction in Asia. The best tropical place in Asia, Best city of Asia, Popular tourist destination and more. Singapore is a country that has many interesting tourist attractions, and is always visited by tourists from various countries. The buildings are unique and magnificent, always seen decorating in every corner of the "Lion" country. Holiday in Singapore is the dream of a number of tourists, who want to feel the magnificent atmosphere of the Southeast Asian state. Although it is a small country, Singapore is a developed country. Before next, Please click SUBSCRIBE my youtube channel. If you are going on vacation, Singapore is a country that you must visit. 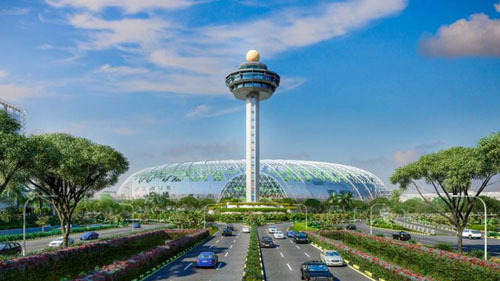 There is a very interesting and fun thing when you arrive in Singapore, and very rarely in other countries, that is you will find tourist attractions in the area of ​​Singapore's international airport, Changi Airport. Yes, you do not misread, in each Changi Airport terminal there are several places that can be used as tourist attractions for everyone. It is an international airport in Singapore that has a variety of luxury and free facilities for the visitors / passengers of the plane, who will leave, or who have just arrived in Singapore. Not only luxury facilities are provided, Changi Airport also has a variety of places that are decorated, so that it becomes a tourist destination for tourists. There is also a shopping center, at one of the Changi Airport terminals. Here are some reviews about the facilities and beautiful places found and things to do at Changi Airport public. This service is certainly used by tourists who use smartphones and android. In addition there are also internet facilities in around 550 computer stands inside Changi Airport. Facilities like this are certainly very pleasant for prospective passengers waiting for flying hours, so they are not bored waiting. At Changi Airport, you can make calls to Singapore Local numbers for free. There are several public phones available at each terminal and you can use them for free. This facility is of course very useful for tourists. One of the unique features of Changi Airport is that there are several flower gardens that have various themes. The flower garden available here seems to be a relaxing place that refreshes the eyes, especially at Terminal 2, which is Orchid Garden & Koi Fish Pond. This park is very beautiful and you will definitely be happy when you are in this area, a combination of various types of orchids with this Koi fish pond looks very perfect. Some other gardens and parks are also found in terminals 1,2 and 3. There are still many more facilities that pamper visitors at Changi Airport. Just arrived at the airport in Singapore, you will find a variety of interesting sights. That is a very pleasant one when vacationing in Singapore. Macau is a small country located not far from Hong Kong. Macau is famous for having a lot of Casino places to visit, even Macau is nicknamed as Las Vegas Asia. In Macau itself Casino games are considered legal, so Macau is the main destination for Casino players from various countries. There are many Casino places that tourists can visit. In addition, Macau is indeed very thick with American and European culture. Now, there is one place that is very famous in Macau, namely The Venetian Macao. There are so many tourist attractions on the Venetian Macao. One of them is Casino, the largest in Macau. There are many tourists visiting this tourist spot, because there are also many other tourist destinations on Venetian Macao, such as ride Gondola, luxury shopping, enjoying the views of various magnificent buildings, staying at luxury European country inns, enjoying culinary delights, enjoying various shows, and still much more. There is a unique thing you can do in Macau, which is to travel around Macau for free using the special Shuttle Bus provided by reputable Hotels and Casinos. Many places in the Casino in Macau provide many free bus facilities to bring tourists to their casinos. This shuttle bus is available at the bus terminal around Macau Airport. If you are from Hong Kong using Torbojet, then you will stop at the Maritimo Terminal. Around the Maritimo terminal there are also many Shuttle Buses available for tourists. The experience of traveling around using the Shuttle Bus will be very exciting and interesting, because you will not be charged Transportation Fees, aka Free. Determine in advance the bus that you are going to ride, according to your destination. After that you can enjoy the sights of various places in Macau. Besides being visited by many tourists who will play Casino, many tourists visit Macau to take pictures and take a walk. So using the Shuttle Bus is one of the tourist destinations favored by tourists. Many tourists use the Shuttle Bus to get to Venetian Macao, because there are many tourist attractions that can be visited by tourists. Buses usually leave once every 10 minutes, don't forget to set up your camera to take pictures at various places of interest in Macau. If you visit Macau, don't let you miss the excitement of using this Shuttle Bus. The Old City of Macau is also one of the main attractions that many tourists visit, namely in Largo Do Senado. Taking pictures in this area is a very pleasant thing, besides that there are also many things you can do here, because this is a tourist area. There are also various historic buildings, and Ruin’s of St. Paul is an icon of the country of Macau. You can use the Grand Lisboa Hotel & Casino Shuttle Bus, to go to this tourist spot. In addition to the free shuttle bus, in Macau there are also public buses that are easier to become your means of transportation, the cost is also cheap enough to be able to surround Macau. The price of this Public Bus ticket is around $ 3.20 for the Macau Peninsula route, and $ 6.40 for the route between Macau Penensula and Hác Sá (Coloane). You can use Macau Dollars or Hong Kong Dollars. This public bus is also available at the Maritimo Terminal and the Bus Terminal around Macau Airport. Macau is a small country located not far from Hong Kong. even so, Macau is famous for having lots of places to play Casino, because in Macau the casino is legal, so this country is a casino tourist destination in Asia. Besides that, Macau is also famous for its European culture. It's really a very attractive Asian region. Here is a pupular, unique and luxurious tourist spot in Macau. It is an area of ​​Resort Hotels, shopping centers, and is one of the largest Casino areas in Macau. This place is a very luxurious place from the interior side. Many tourists have fun to enjoy their holidays in Venetian Macao, ranging from playing casino, shopping, staying in luxury hotels, dining in restaurants, watching entertainment shows, rides, riding Gondola, sightseeing, and much more. The Venetian Macau is on the Cotai Strip, you can use a taxi or bus to get here. The interior and architecture of buildings that are characterized by European countries are very luxurious in Venetian Macao. The luxury is an attraction for tourists to enjoy the European style which is certainly in great demand of tourists from various countries. 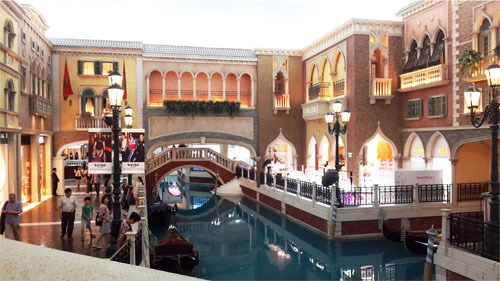 Here are Awesome things to do in Venetian Macao. There are several hotels with the theme of several different European countries. Like The Venetian Macao which is a Resort Hotel with typical Italian buildings. This hotel is certainly a favorite of many tourists. The atmosphere of Italy will be felt here, because there are also artificial ponds that are like rivers, with some typical Venetian Gondola boats passing by. “The Venetian Macao Hotel Resort” is a favorite in Venetian Macao. In addition there are also several hotels with other European-style nuances, such as The Parisian Macao with French-style buildings and Wynn Macau Hotels that have typical buildings like hotels in Las Vegas. Staying at a hotel with classic and stately European and American buildings is certainly a very impressive experience. You will really feel like you are in that country. This classic yet elegant rowing boat is from Venice, Italy. This Gondola boat attracts many tourists on Venetian Macao. 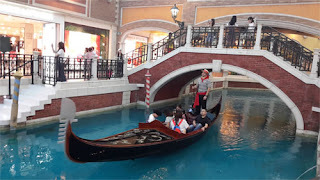 This gondola surrounds the artificial canal located in the area of ​​the Venetian Macao Resort Hotel. A very romantic Italian atmosphere, you can feel if you ride this Gondola. The Gondola rower also often sings very sweetly, so that it can add a romantic impression. If you come with your lover or family, then you must take a Gondola, which has a capacity of 4 passengers. Here you can shop for anything, from branded fashion, to luxury jewelry. There are many rows of luxury boutiques available here, you must have a souvenir to take home if you visit Venetian Macau. You can shop to your heart's content, if you still have a lot of money. Surely this place has a very luxurious interior and facilities. Macau doesn't have its own currency, so you need Hong Kong money to shop here. At the Venetian Macao Food Court you can sample a variety of delicious Asian and European cuisines. There are so many menu variants that you can choose as your culinary tour at Venetian Macao. Eating a food menu while enjoying a typical European scene, is certainly a very pleasant thing, and will not be forgotten. Lots of Casino players from various countries who deliberately come to Venetian Macao to try their luck by playing casino. In Macau, the casino game is considered legal. Venetian Macao is the largest casino place in Macau. You can try your luck here, but you cannot bring minors. If from Hong Kong, you can use Star Ferry to go to Macau. 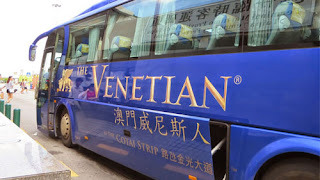 After you arrive in Macau, you can take a bus from the Maritimo Terminal Shuttle Bus, to get to Venetian Macao. This bus terminal is opposite the Macau Ferry Terminal. This bus is a Venetian Macao Special operational bus. The bus operates at 10am - 11pm local time. Star Ferry is the main transportation to move between islands in Hong Kong, sailing from the port of Victoria, you will enjoy the beauty of views of skyscrapers in Hong Kong. Ferry ships have always been transportation to move between Hong Kong and Kowloon since 1888 to date. 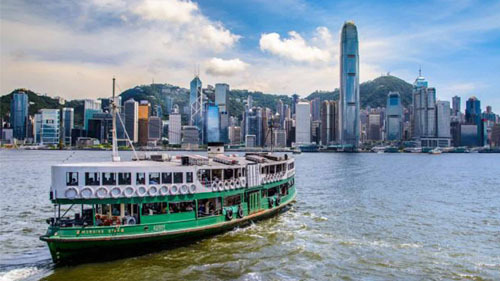 Many local and native tourists here prefer to use Star Ferry transportation even though there are currently roads and tunnels underground and sea connecting the two. The cost of using Star Ferry transportation is cheaper and faster than riding the MTR, besides that tourists can also see more closely the port of Victoria. The Star Ferry operates from 1888 to the present and the locals have used Star Ferry to reach 100 years ago and will continue to be used for life for Hong Kong people and tourists visiting Hong Kong. Beautiful views of the Star Ferry, attract tourists who are on vacation in Hong Kong. Holiday in Hong Kong is a pity if you don't see the view from the Star Ferry. In addition, many tourists also enjoy the beautiful scenery of Victoria Harbor, and the Star Ferry that sails. This amazing sight is the hallmark of Hong Kong. The best place to get a beautiful viewpoint is Avenue of Stars at Tsim Sha Tsui, Hong Kong. 1881 Heritage Hong Kong is one of the oldest buildings belonging to the Hong Kong government which currently still stands firm and luxurious in Hong Kong and becomes a historical tourist spot. Formerly 1881 Heritage functioned as a marine police office complex. This 1881 Heritage old building was founded in 1884 located in Tsim Sha Tsui Kowloon Hong Kong. This place is visited so crowded because it is close to other tourist attractions such as Clock Tower, Avenue of Start. Today Heritage is an attractive and historic tourist destination because in this place you can find shops that sell world-famous branded products, especially fashion products. If you go to Hong Kong don't miss to stop here. There is a Time Ball Tower in 1881 Heritage. Time Ball Tower in ancient times became a very important role for sailors from 1885 to 1907 because it became an alloy in Victoria Harbor. If you stop here, you can get a free tour combination provided by Heritage 1881. To reach the 1881 heritage tour it is very easy, you just need to choose the destination Tsim Sha Tsui station if using MTR and continue walking on Salisbury road. This area is close to Ferry star Tsim Sha Tsui and not far from the clock tower and Avenue of Start. You can see a myriad of interesting attractions at Singapore's most famous and best international airport. Singapore is one of the best airports in the world so you can experience various entertainment venues here. You can do various activities at Singapore's international airport which is equipped with shops, restaurants, entertainment, a resting place and even a hotel if you are in a long transit here. This airport is designated as one of the best airports in the world because it promises an experience that is not easy to forget in its three terminals. At Terminal 2 Singapore there is a beautiful and attractive butterfly garden. This park is the first butterfly park in the world located inside the airport. In addition, there is an oriental oriental foot massage. You can also get free internet access for free here if there is work for you to complete while sitting in a comfortable chair. Orchid Garden & Koi Pond in Singapore. A myriad of interesting attractions that you can get at Singapore's international airport in its three terminals. This famous airport provides a variety of entertainment, shops and various foods and drinks you can easily find. Singapore Airport presents an experience that is not easy to forget for those of you who have visited it, because Singapore's international airport is one of the best airports in the world. Orchid Garden and Koi Pond (Terminal 2), in this orchid garden, various types of unique orchids from various countries can spoil your eyes even more if you are a hobby of this plant, the garden in a very beautiful design characterizes Singapore. A beautiful collection of rare orchids and hybrids can be found here, including the Singaporeans - Vanda Miss Joaquim - and the Changi Airport's Dendrobium Changi Airport.